How to create object of class? The class is a template, declaration or blueprint that is used for classifying the object. It encapsulates variable members, functions, structure, properties and many more components. It is the basic building block of object-oriented programming. In order to create a class, the class keyword is used. After creating class, you can use it by creating its object. An object is created using new keyword. Suppose you created a class print that contain following method. //executing method of 1st class. The class name should be noun and meaningful. Use either pascal case or camel case. In camel case, the first letter is small. Ex. camelCase. In pascal case first letter is capital. Ex. PascalCase. It is strictly recommended you to use pascal case for class name and camel case for variable name. Your class name should not contain any special character except underscore (_) or digit. Must start your class name with character. Don’t use reserved keyword for class name. 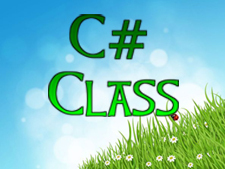 In this chapter you learned about what is class in C# and how to use it in program. In next chapter you will learn how to declare method in C#.